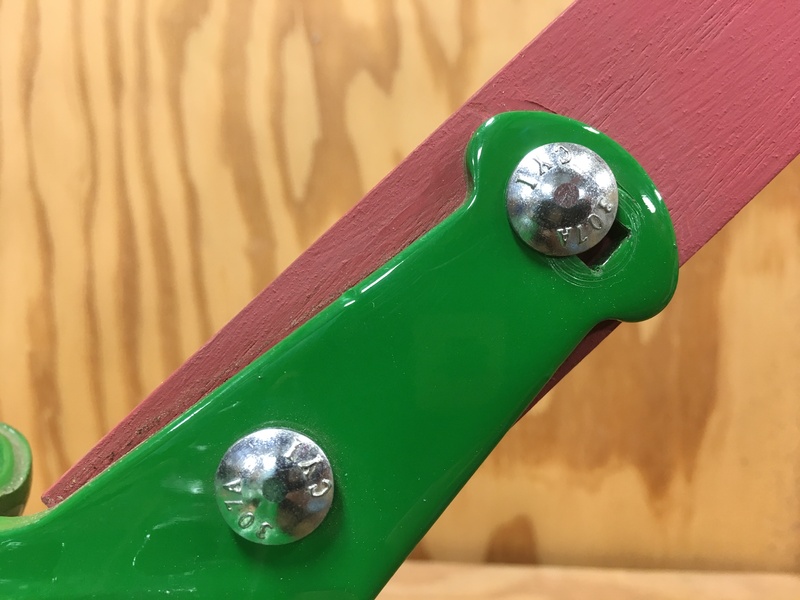 Here are two of the most frequent questions we get from new customers: “Should I get the steam bent wheel hoe handles or the pistol grip wheel hoe handles?” and “Should I get the standard wheel hoe handles or the junior wheel hoe handles?” So, there’s two separate issues to cover here — handle styles and the height adjustment of the handles. We’ll start with the handle styles. 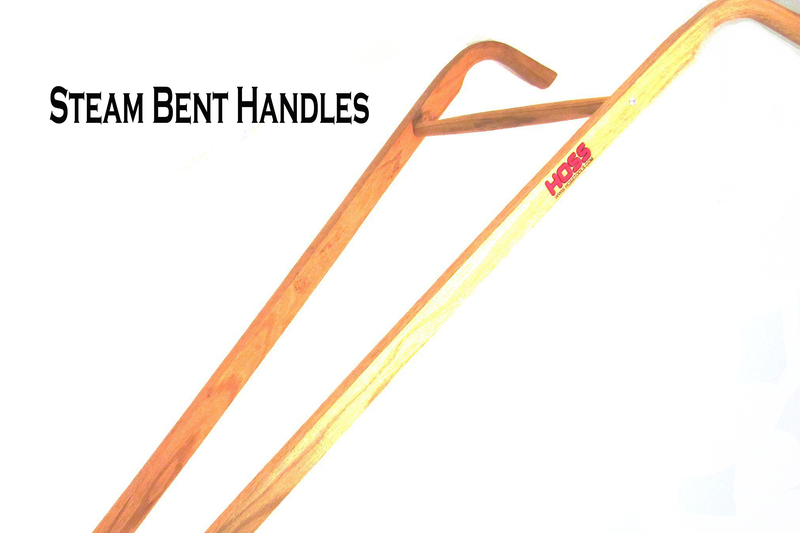 We have two different styles of hardwood, ash handles for our Wheel Hoes — steam bent and pistol grip. 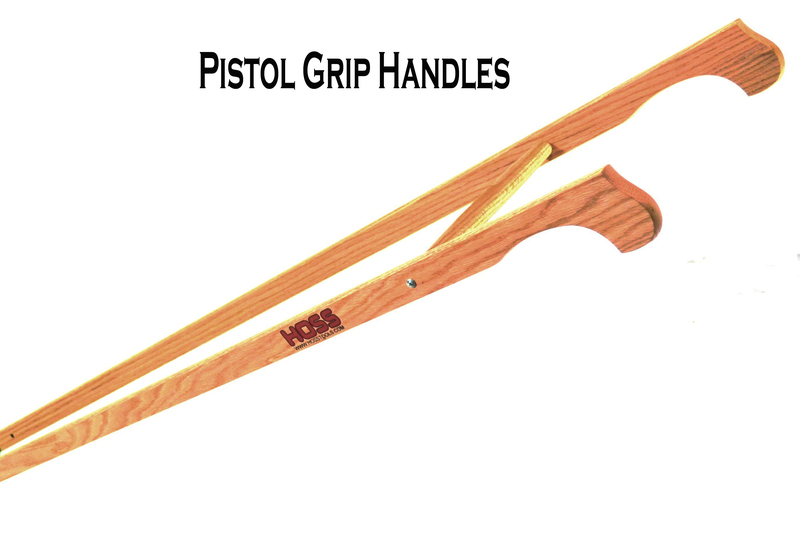 The pistol grip handles have a wide block at the end that fits in the palm of your hand with your fingers wrapping around like the block like you are gripping a “pistol.” This type of handle was the preferred design in the late 1800s and early 1900s when Wheel Hoes were the preferred tool for all farmers — not just market farmers and backyard gardeners. The steam bent handles have a curved end that’s not as thick as the pistol grip handles. 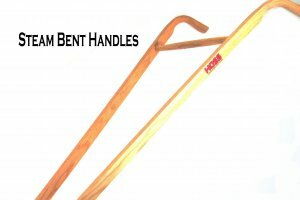 The ends of the steam bent handles are bent and formed by an Amish group in Ohio who uses a very detailed and unique heating and bending process. In the early 1900s when pistol grips were most popular, the steam bent handles were actually an up-charge option on the Planet Jr. Wheel Hoes. So which is best? Nowadays most people prefer the steam bent handles because it’s easier to wrap your hands around them. They’re also easier to grip when performing a forward and backward shuffling motion of weeding or cultivating, such as is done with our Oscillating Hoes. 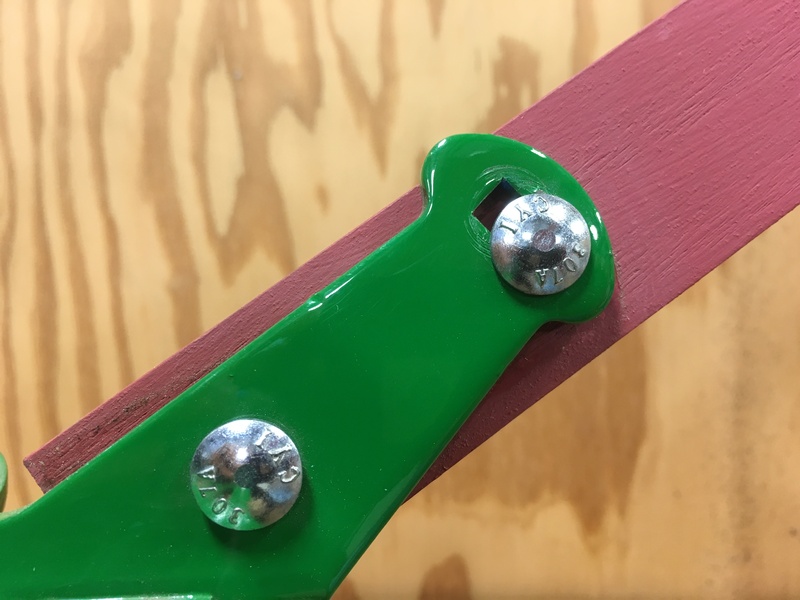 The pistol grip handles work great when the Wheel Hoe is being continuously pushed forward down the row, such as is done when using the Plow attachments. It’s really about personal preference. If you’re just using it to make furrows and hill with the Plows, the pistol grips might be best for you. If you’re going to shuffle the hoe down the row like has traditionally been done, then the steam bent handles are probably best. We also have two different lengths of handles — a standard handle (Single and Double Wheel Hoe) and a Junior Wheel Hoe handle. The Junior Wheel Hoe handles are the same steam bent handles included with the Single and Double Wheel Hoe, except they have 10″ cut off the end. In the location on the Wheel Hoe frame where the handles attach, you will notice that the top bolt hole is slotted. This slotted hole allows you to adjust the handles up or down depending on your height. Simply loosen that nut on each side, move the handles to the desired height and tighten the nut. For the standard wheel hoe handles included with the Single Wheel Hoe and Double Wheel Hoe, the range of height adjustment is 38″ to 45″ from the ground to the tallest point on the handles. For the Junior Wheel Hoe handles, the range of height adjustment is 33″ to 39″ from the ground to the tallest point on the handles. As with handle style, handle height is also a matter of personal preference. Some people push the Wheel Hoe using more leg strength than arm strength, and so they prefer the handles lower on the hip. However, some people push the Wheel Hoe using their upper body more than their legs, and so they prefer the handles higher above the hip.